It’s been on the chilly side for a couple of days. And although we’re not getting slammed with snow down here in Dixie, it’s nice to have a good hearty meal at night. 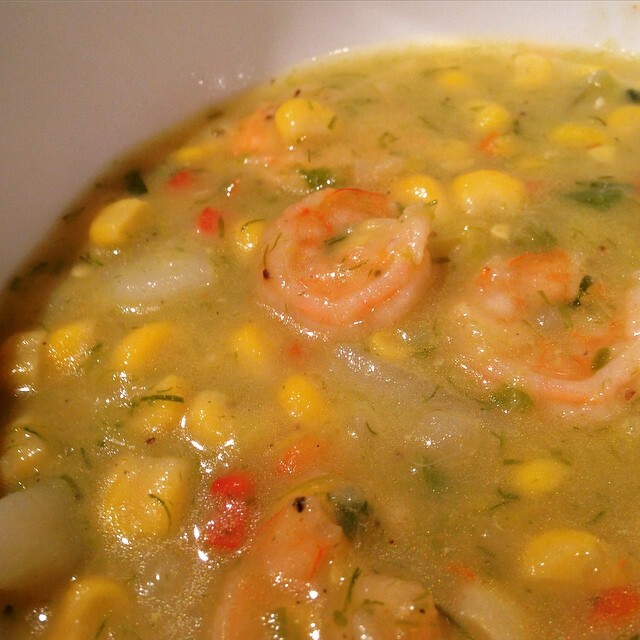 That’s why I came up with this Spicy Shrimp and Corn Chowder. This is definitely one of those recipes where you want to get your mise en place in order before you fire up your stove. Between peeling and deveining shrimp and chopping veggies, the prep is relatively time-consuming. But once you get cooking, it doesn’t take very long at all before it’s ready to serve. It’s perfect for cold winter nights like this. It’s hearty, flavorful, and filling. The heat from both the jalapeños and the piping hot temps you’d serve this at will keep you warm inside and out. And since this recipe makes plenty, I bet this is one of those “even-better-the-next-day” kind of meals. Plus, I’d say that it’s great for those snow-in situations my friends to the North are experiencing right about now. Sautéing the veggies for the soup. Salt, pepper, and Old Bay seasoning to taste. Salt, pepper, and Old Bay Seasoning (or similar) to taste. Start by sautéing the corn over medium-high heat until most of the water steams off. Then sauté the leek, bell pepper, celery, and jalapeños until tender. Add stock, check and adjust seasoning, then bring to a light boil. Add potatoes, reduce heat to medium-low and simmer for 20 minutes. In a bowl, whisk combine corn starch and cream. Add mixture to pot. 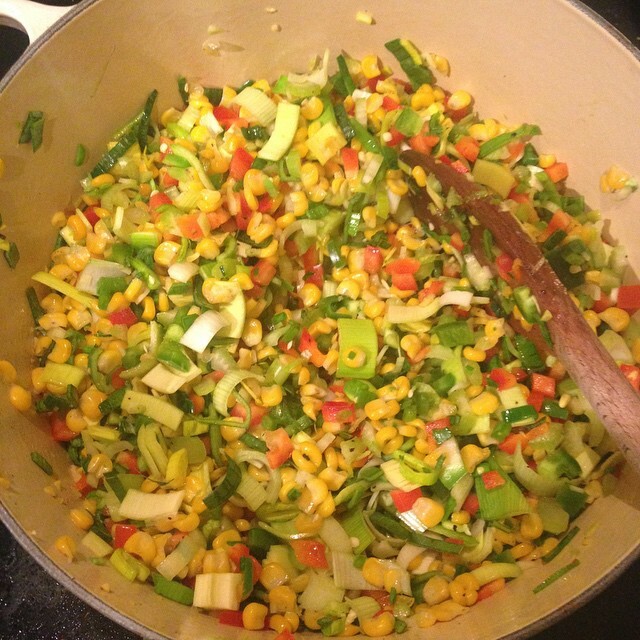 Reduced-fat alternative: Whisk the corn starch with some broth from the pot and add that mixture into it. Add shrimp to pot and simmer for another 10 minutes to “activate” the corn starch and cook the shrimp. Remove from heat let stand for at least another 15 minutes to thicken. Serve hot in bowls, sprinkle a little extra Old Bay on top, and enjoy!